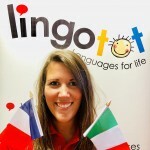 Wakefield Lingotot Centre | French and Spanish classes for kids. MFL PPA cover. My name is Bex and I run languages classes for 0-11 year olds, across Wakefield. I am Mum to a 6 year old boy, William and he's testiment to how amazingly well children pick up a second language, it's true they are sponges! I studied French and Italian at university and was really lucky to be able to use my languages in my job, whilst travelling around the world. Then I had William and decided to stop being a globe trotter (it's not as glamourous as it sounds!) and went into schools. I've loved my time as an Assistant SENCo, in a school with such a diverse range of needs! But since starting there, I've missed being able to use my languages on a day to day basis. Along came Lingotot....! Lingotot lessons are a wonderful mix of interactive games, songs, stories and crafts conducted almost entirely in another language; you get to learn alongside your child whilst having lots of fun together. Classes are suitable for babies, toddlers and young children and we offer plenty of support for parents/grandparents so that you can continue your family's learning at home. I will be working across schools, nurseries and in communities across Wakefield and I'm so excited to be able to share my passion with you. I'm looking forward to meeting you at a class soon! The children at Silkwood Private Day Nursery absolutely love their French lessons with Rebekka from Lingotot. During this time of a child’s life, their brains are lie sponges constantly absorbing information around them, this makes a perfect time for children to learn a second language. Rebekka makes the session’s fun and exciting through the use of songs, rhymes and games. Rebekka also provided a booklet that tells us what the children will learn each week during their lessons and activities that they can do at home, and at nursery, to support their learning. Overall Rebakka is a fantastic teacher! We thoroughly enjoy her visits to nursery and look forward to continuing with French lessons in the future. Eve is loving her French lessons with Bex. I can’t believe how much she has learnt in such a short space of time. The only problem is as I don’t speak French I have to google if she’s right (which she is!) when she wants to tell me all about it every week. She has even taken to writing out French words and is trying to teach me. I am an Assistant Head Teacher at a three form entry primary school where we cater for over 600 children. We have been incredibly impressed with what Bex and Lingotots have brought to our team. The decision process was clear, extremely well organised, thorough and everything has been explained, supported and easy to follow. The package flexibly catered for the needs of our children and staff and Bex took the time to get to know our school context and children so that she has slotted in as another, natural and well loved member of our team already. The children love every minute of their French club, staff feel enthused and inspired and we can’t wait to continue our working relationship with Bex and Lingotots! Bex’s high level of expertise means that children are accessing authentic French in meaningful and fun ways which will lead to long lasting learning. Bex values every aspect of the importance of integrating French in to all areas of school life and the curriculum- language and culture- and this mirrors our approach. I would recommend every part of the process very highly. Bex is friendly, warm and exudes kindness and a love of languages which has enabled her to form lovely relationships with our children. You need Bex in your school!